In the far northwest reaches of the colony of Virginia a young officer fired the shots that began the French and Indian War. 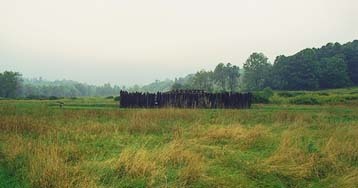 After attacking a small party of French soldiers from Ft. Duquesne, Lt. Col. Washington returned to the Great Meadow and completed Fort Necessity. Here he awaited the French retaliatory attack that was sure to come. On a rainy, dismal July 3rd, 1754, his powder wet and ammunition running low, with nearly half his men sick or wounded or dead, Washington offered his only surrender to a foreign power. The next day, July 4th, with drums playing and flags flying according to the protocal of war at that time, the remnant of Washington's little army marched out of the fort and made their way back to Ft. Cumberland. The French were, for a time, masters of the Ohio Country and the heart of North America. But there would be a war for the empire.